A sequence of commands (or macro) allows you to configure multiple commands to be sent when you press a single button on your remote or remote's screen. For example: if you use a PIN/password on your cable/satellite box to purchase movies you can program a remote or screen button to automatically send the PIN numbers. 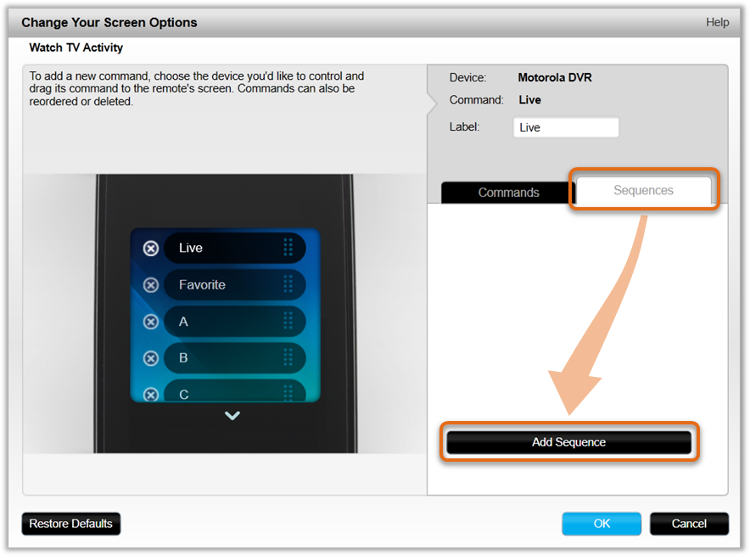 Select HARMONY SETUP, then ADD/EDIT DEVICES & ACTIVITIES. Select REMOTE, then ACTIVITY CONTROL BUTTONS. Select the Activity for which you would like to create a sequence. Select the button for which you wish to assign a sequence. Select DEVICE NAME, then SEQUENCE and NEW SEQUENCE. Enter a name for your sequence, then select ADD A STEP. Follow the steps to assign additional commands and/or delays. A sequence is unique for each Activity and will only send commands to devices included within that Activity. It can contain up to 25 commands and delays. There is no limit to the number of sequences you can create. Let's create a sequence using the above PIN example. 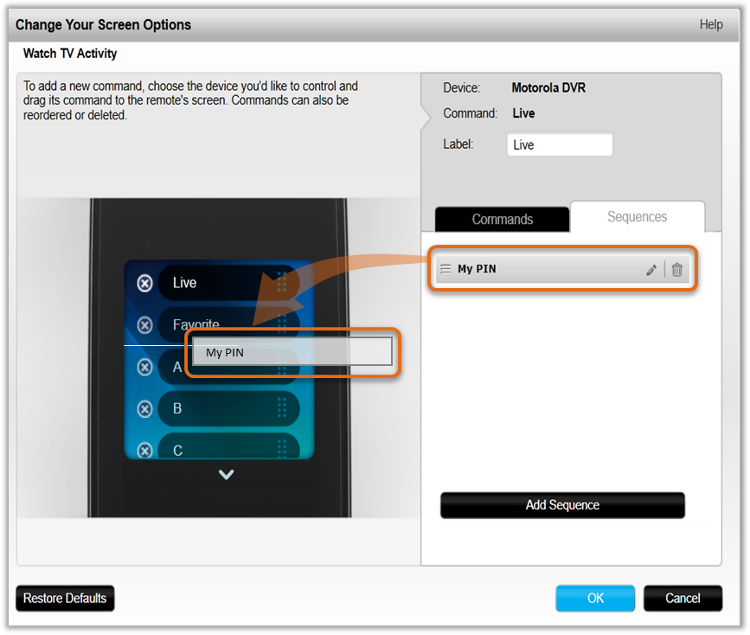 In either the Screen options or Remote buttons section, select the Activity for which you'd like to create a sequence for (ie. Watch TV). 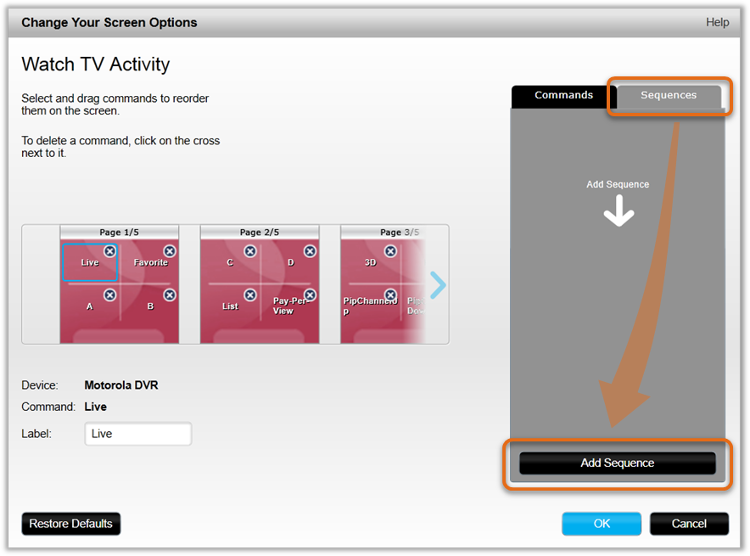 Sequences created in the Screen options menu are also available in the Remote buttons menu for that same Activity. Name your sequence. Try giving your sequence a name that represents what it does. For example, 'Send DVR PIN'. Click + Add Step to begin adding commands. Continue adding line items until your sequence is complete. You may add commands for any device used in this Activity. Click Add Delay if you need a brief pause between any two commands. You may now assign the sequence to a screen or remote button. 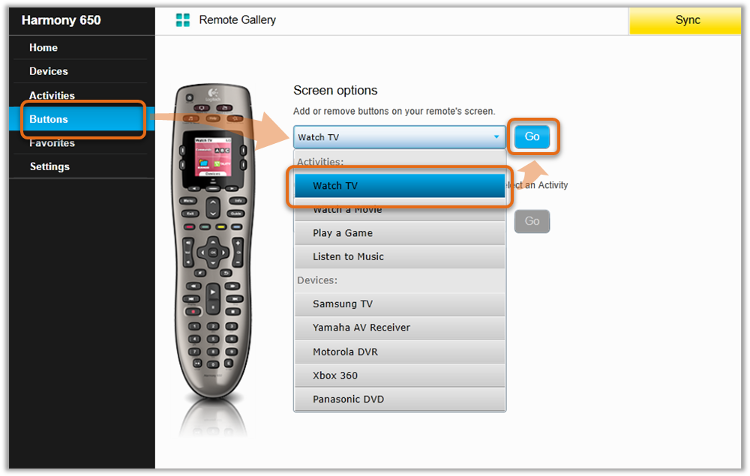 Learn more about assigning commands to your screen or remote buttons.